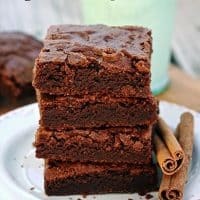 If you love chocolate with a little bit of heat, then you’re going to love these Mexican Chocolate Brownies! My family knows that my favorite chocolate bar is the Lindt Excellence Chili Bar. They think I’m crazy, but if you’ve ever tried chocolate with a hint of chili, you know how awesome it is. The good thing is, none of them ever touch my chocolate chili bar. That may change though, now that they’ve had a taste of these Mexican Chocolate Brownies. They all agreed, these brownies are pretty darn good! They’re rich, dense and chewy, with a hint of cinnamon and cayenne. I really like a spicy kick, so I use the full 1/4 teaspoon of cayenne pepper, but if you prefer a more subtle chili flavor, go with 1/8 teaspoon. Either way, these brownies are the perfect way to end your Cinco de Mayo celebration. In a large bowl, combine flour, cocoa, and salt, cinnamon and cayenne. Add butter mixture to flour mixture and stir until well blended. Spread brownie batter into prepared pan and bake for 25-30 minutes. Cool completely before cutting into squares. Hi Danelle! My little man and I love chocolate bars with chili. 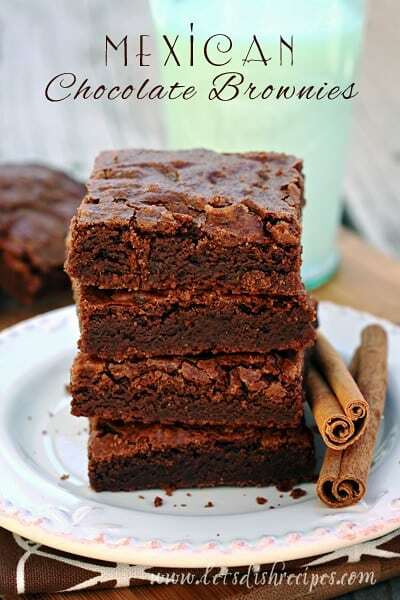 These brownies look delicious, too. I love those chocolate bars! And these brownies?! Omgosh, they sound to die for!! Pinned!